If you have been following my blog for some time you must have noticed that Syrian cuisine, especially in Damascus, is very light on the spice side. In many many dishes salt and pepper, or allspice, is the only seasoning. We make up for this by using fresh strongly flavoured ingredients. We love lemon for example and we use it quite a lot in our food. Olive oil, fresh coriander and garlic all feature heavily in our cuisine. These ingredients are often used in combinations. The most obvious example is green coriander and garlic. These are usually fried very gently in warm olive oil and used in an endless number of dishes. Today's recipe uses one of these classic combination: lemon, garlic and olive oil. The three flavours matches perfectly together. They work very well with grilled chicken. You can use them as a marinade or to drizzle over your spatch-cooked barbecued chicken or even a dipping sauce. Today's dish is one of my all time favourites and regular dish on my big family dinners. We always called this dish in our household Oven Potato with Lemon, Garlic and Oil. Although chicken is the main ingredient in this dish for some reason we always ignored its presence in the name. May be because the main flavour is not the chicken but the strongly flavoured potatoes. Anyway, if you don't like the name call it Lemon Chicken Roast or Oven Chicken and Potato or any other name you like. You can use any cut of chicken you like. Thighs, legs, breasts, on or off the bone, with or without skin all works fine. I even used chicken wings only on occasions. Today I am using cubed chicken breast purely because this is what I had in the fridge. The only thing to keep in mind that you need to adjust cooking times depending on the cut and the size of chicken pieces you are using. P.S. this dish is heavy on lemon , garlic and olive oil so if you don't like any of these ingredients this dish is not for you. Similarly if you are looking for a dish to cook for a romantic dinner and you are planning some bed-time activity then again this garlic infused dish is not for you. Put the chicken in a freezer plastic bag. Add the crushed garlic, lemon juice, salt, pepper, olive oil and the chillies. Mix well and let marinade in the fridge for few hours. Peel the potatoes and slice into 5mm slices. Deep fry the potato and vegetable oil till almost done. Drain and layer the potato in the roasting dish. Arrange the chicken on top of the potato. Add all the marinade juices to the roasting tin. Top with hot water up to the level of the potato. Bake in the oven till the chicken is fully cooked. You will need 25-30 minutes for chicken breast. If you are using thighs or chicken breast whole on the bone you will need 45-60 minutes and you will need to turn the chicken for the skin to brown on both sides. A Perfect Meal, My mom makes it all the time but with a bit of deviation cause we add fresh off the bush rosemary which we grow in our garden in Jerusalem. Thanks for the info on the cooking time when using boneless chicken breasts cause there the best when you come back from college with a big appetite especially when spending your whole day in clinical rotations. one of my all times favourite. i usually put slices of onions as the first layer and then layers of thin slices of potatoes. and finally the chicken. but why do u fry the potatos? wouldn't it be better - and lighter - if u put them all in all in the oven and left them to get cooked slowly there? So I am wondering where you buy your chicken and whether you pay attention if those birds have been raised on antibiotics or get a vegetarian diet. Luckily, where I live in the U.S., a supermarket chain called ShopRite carries its own brand of drug-free chicken, which is priced between conventional and organic. A fellow medic! welcome to my blog. There are few variations on this dish I know but this is the first time I heard of someone adding rosemary. Sounds interesting. You can use the potato raw of course. I tried it both ways. I find the texture come better if I fry the potato first. It is a matter of personal taste. The only thing to keep in mind if you are using boneless breast meat that it cooks quickly. There will not be enough time for the potato to cook. If you are using whole pieces of chicken this will not be a problem. To be honest with you, and I know it is a subject you care a lot about so please don't take offence of what I am going to say , I don't really pay attention. I chose my food based on how it tastes. I like to consider myself as a man of science. So unless I see a convincing scientific evidence the jury is still out for me. I don't believe there is any benefit to organic food, apart from the huge benefit to the pockets of the "healthy living" brigade. So I don't really mind if my food is GM or produced with added nutritional, medicinal or fertilising agents. Quite the apposite, I actually support the use of all of these for the benefit of the hungry millions in Africa and Asia. What they need is beneficial, easily produced and resilient crop. What they don't need is Cosmopolitan magazine telling them how to live. I love all the ingredients in this dish, lemon, olive oil, potatoes, chicken and of course lots of garlic! Looks and sounds delicious! Give it a go. I promise you, you will not be disappointed. I enjoyed the comments as much as the recipe! Frying the potatoes is a good step taste-wise; I bought a chicken yesterday in Beirut and found they had placed its head (beak wide open, eyes starring in horror) inside the neck cavity. I felt reassured at that point that this chicken was real and perfectly healthy when it was killed for our meal. I like the ingrendians and i am going to try it out in weekend. And make my weekend with something new! Oh piffle! There is no reason not to eat this on a romantic night, you just have to make sure you both have some! Lemon, garlic and olive oil are all essential to life as far as I am concerned. I am glad you like the comments. This is what makes new media interesting. Blogger, facebook, twitter, YouTube is not the same with the comments and different opinion it generates. The chicken,garlic,potato and olive combo sounds interesting .. and the picture looks tempting enough to try . I just took a quick look at your blog. It looks great. I will go back to look through the recipes and try some. I hope you try this recipe. I am sure you will like it. looks yammy i am gonna try it.. Welcome to my blog. Please try it and let me know how it goes. this recipe was excellent..simple to prepare rich flavorful, and delicious.. i loved the idea of frying the potatoes before baking it.. it just makes a huge deference. I am so glad that you tried it and more importantly, you liked it. i loved the idea of frying the potatoes before baking it. Frying the potatoes makes them much softer and they absorb the flavours better. I've been reading your blog for a month or so - very inspiring - i am a great fan of mezze/tapas food cultures. 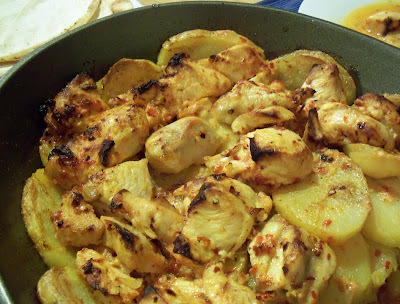 Tried this tonight (almost - harrisa instead of red pepper sauce and equal volume of chicken/potatoes/ quantities more than halved for a solo diner) It was so tasty I finished off the juice in the roasting pan with a soup spoon. On the strength of that success I'm going to look for the poor man's pilaff you adapted for, i think, the guardian with the crispy onion topping. Welcome to my blog! I am so glad you like the blog. Please don't be quite in the future. I would love to hear your comments and thoughts. I am really happy the recipe worked and you liked the dish. Waiting to hear your Mujadara success. This dish is so tasty! I highly recommend. And it's a great, 'Oh God, I haven't done the shopping what do I cook tonight?' dish. I used the drumsticks I had on hand and added a little stock powder to the water but it probably didn't need it. Pre-frying the potatoes is a great idea, gives an extra something to the dish. Mmm sounds good. Do you have a recipe for the tasty toum (garlic) dip that usually comes with every grill chicken order in Syria? So sorry for late reply and welcome to my blog. I don't have a recipe for the "real" toum but you can check my Shish Tawook recipe for a super fast version.